CNR-Sidetone is a small USB-powered audio mixing device that connects the user's headset and computer, providing several key features that dramatically enhance the audio realism within your simulated radio environment..
Sidetone: The feedback of a microphone signal at a reduced volume back into the associated headphones, allowing a user's own voice to be heard as part of that user's headphones' audio environment. 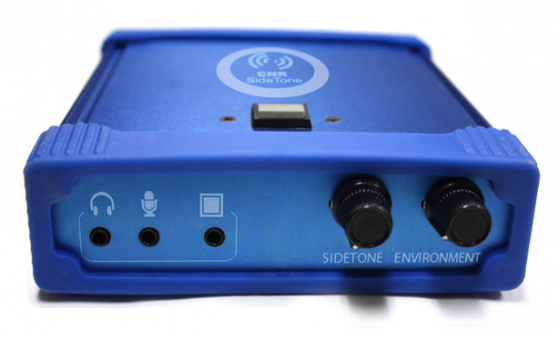 The Presence of a 'sidetone' gives the User the sensation that the microphone and associated equipment are working properly, that the microphone is "live". Lack of sidetone can give the wrong impression that the user is speaking into a non-working ("dead") microphone. Sidetone increases the realism of training for trainees using headsets. In addition, some systems use the presence of sidetone as positive reinforcement to the user that the user's microphone has been activated.